As mentioned earlier, for their declining years with Columbia the Three Stooges’ producer-director Jules White released new films reusing earlier scenes with crude obviousness to fulfil his quota. In the case of their last horror-comedy combination Creeps (1956), the recycling transplanted roughly two-thirds of the entire scenes from 1949’s The Ghost Talks book-ended by new footage and a little cunning re-dubbing. The premise for returning us to that haunted house this time is that now the trio have three children, (themselves in baby outfits), who are as quarrelsome and violent as their parents. 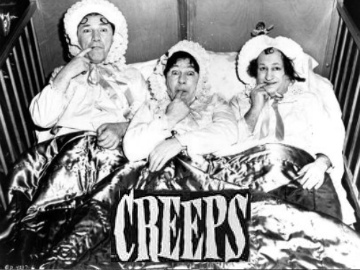 The only humorous aspect is Moe’s disturbing enthusiasm for a bedtime story “with a lot of killings and a lot of murders in it so we can sleep real good!” To pacify this ugly brood, their parents recall their time as removal men. There’s no need to revisit the plot except where it differs from the original film. In this version the Lady Godiva/Peeping Tom sub-plot is cut out; the possessed suit of armour has new lines voiced by Phil Arnold identifying himself as Sir Tom, a brave knight afraid of unscrupulous antique dealers selling him off. The Stooges of course ignore his appeal to their cost when the suit defends itself with a sword, running riot and slicing into Moe’s trousers as he cowers in fear. There is another new scene intercut where Shemp almost gets it in the neck from a guillotine. Back in the kiddies’ bedroom, they still won’t sleep after this story so what do their dads do? They pull out hammers and hit their kids with them (reusing the three NBC chimes audio gag). Although this reads like a BBFC transcript of cuts in a 1980’s British Video Nasty, fortunately this is pure slapstick – although you could extrapolate future serial killer possibilities from such an upbringing. A more troubling real-life postscript was that after shooting in this period for the following year’s releases, in November 22nd 1955 the Three Stooges’ line-up suffered another tragedy when Shemp Howard died of a heart attack coming home in a cab from a boxing match. He had only agreed to fill in temporarily for the ailing Curly with some initial reluctance but had stayed loyally with the boys for eight years and 76 of their shorts. The kinder option to disband their act after 21 years of gradually lowering standards was not open to them since they still owed Columbia four more shorts from their contract with Shemp. They had to find a replacement to at least cover for his absence, which led to the recruiting of ‘Fake Shemp’, actor Joe Palma, who doubled as the real Shemp filmed from the back to complete films such as Rumpus in the Harem and Commotion on the Ocean. The Three Stooges were far from finished though. 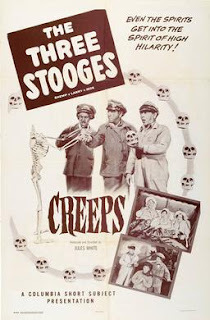 Seeking a permanent third Stooge they even considered Manton Moreland who made Monogram’s slapdash King of the Zombies tolerable (see my review 5/12). His energy combined with the ethnic diversity would have made interesting refreshment but the studio insisted on an in-house contracted artist. They settled for Joe Besser with whom they made another 16 shorts for Columbia. These proved to be the death-knell for the ‘brand’ in their current form. After the Stooges’ contract failed to be renewed in 1957, they appeared to be all washed-up. It was the expanding television medium, that perceived threat to cinema, that ironically gave the Stooges a new lease of life the following year, being a natural home for small-scale comedy and a secondary outlet for the vast stockpile of 190 shorts in the Columbia vault. TV saved many an aging and flailing comedy act such as Abbott and Costello and for the Stooges the new audience of children reactivated their live appeal. To capitalise on the new demand, they recruited Joe DeRita whose head was close-cropped to resemble more the hugely popular Curly, and thus his new moniker became ‘Curly Joe’. Throughout the 1960s the Three Stooges remade themselves as big box-office live performers and this revitalised appeal spun into a series of features such as The Three Stooges in Orbit (1962), cameoing in It’s a Mad Mad Mad Mad World (1963) and that same year in Sinatra and Martin’s quasi-Rat Pack western comedy Four for Texas. In 1965 they were able to cover their advancing age by filming colour slapstick sequences to bolster the animated The New Three Stooges whilst lending their voices to the characters. By 1969, they were filming for Kook’s Tour, a proposed series of international travelogue-based sitcom shows. However Larry suffered the first of three incapacitating strokes, passing away in January 1975. Moe joined him in March, a victim of lung cancer, followed by Joe Besser in March 1988 and Joe DeRita in 1993. Though their comedy-horror films were mostly shot during their downward slide in quality, the Three Stooges have retained a lasting screen immortality as one of the greatest comedy teams, allowing their best work to be constantly played on American TV and for home collectors on DVD.